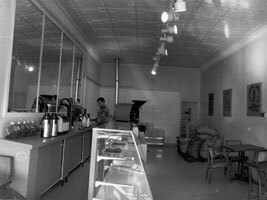 In 1987, the Brothers Dunn (Ed & Dan) opened a little coffee shop at 1569 Grand Avenue in St. Paul, Minnesota. Ed began his coffee career in retail, first as a roaster, then green-bean buyer, and eventually opening Grand Avenue store. He has dedicated his life to being an evangelist of good coffee -- and the caffeinated everywhere thank him. At Dunn Bros Coffee Grand Avenue -- Great Java, No Jive -- is more than just a slogan. It is the mantra that draws customers back to the Mecca of Joe.